I hope you had a wonderful weekend! It was Canadian Thanksgiving this past weekend. I had such a wonderful time with our families, enjoying great food and great company. There is absolutely so much to be thankful for in life. I’m particularly thankful for the people around me that make my life an amazing one to live. Though my long weekend got cut short due to business travel plans, but nonetheless, it was a great one. Today, a quick and easy DIY to share with you, but one that is absolutely stunning! 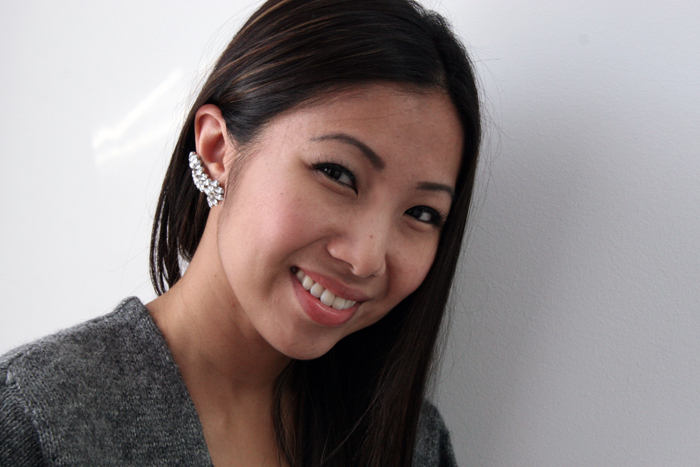 I am obsessed with ear cuffs and of course couldn’t help it but to create my own. This only took less than 10 minutes and the result is both elegant and chic. 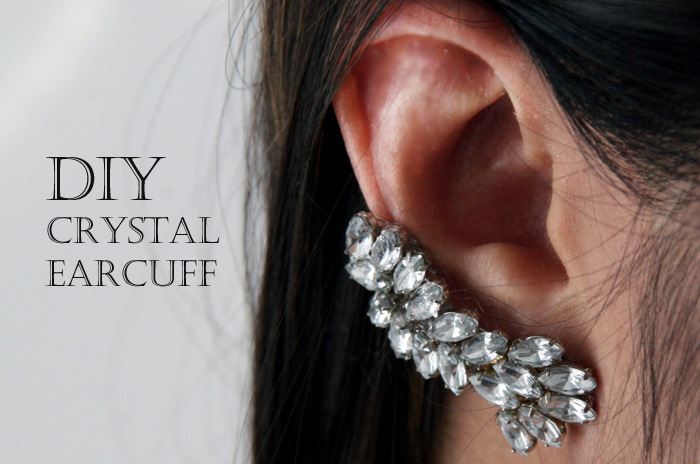 What do you think about ear cuffs? Yay or nay? Trace the curvature of your ear by placing the clear vinyl over your ear with a Sharpie marker. If you have a hard time, have someone give you a hand. Cut out the traced shape. I decided to create a cuff that went only about an inch up my ear. 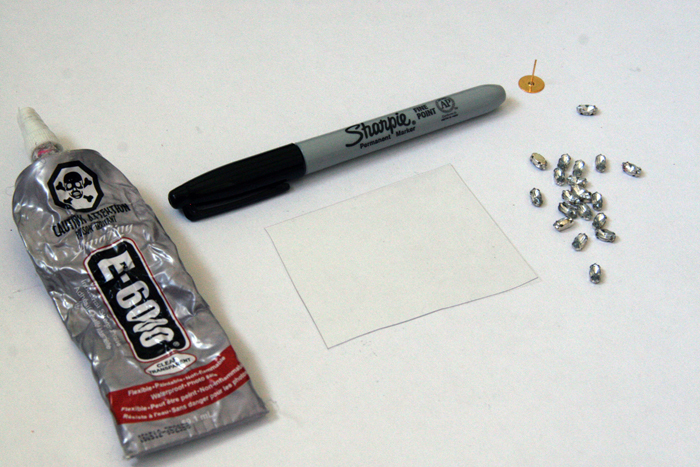 Squeeze some E-6000 glue to a surface working area and begin to apply the rhinestones to fill up the shape. Continue to fill out the ear cuff shape. When completed set aside for at least 2 hours to dry. 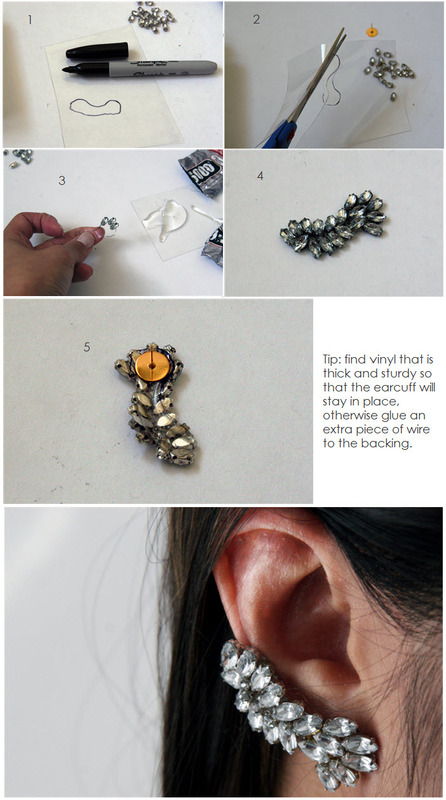 Once dried, glue an earring backing to the back of the ear cuff. NOTE: If your ear cuff doesn’t stay up on your ear, you can glue a piece of wire bent to match the shape of the curvature to the back of the ear cuff. I hope you’ll give this one a try! If you’re not into ear cuffs, try using this exact same technique to create a pair of chandelier earrings. I guarantee the results will be breathtaking. If you rather buy, here are a few good options – here, here, and here. More from me this week, chat soon! easy peasy , but sooooo gr8! Cute! Where did you buy the rhinestones? I’m totally loving your ear cuff. Really cool DIY!! Companies listed on Angies list tend to have purer reviews than on free review sites. and leading to an overflow and leakage situation. then wait about fifteen minutes.